HINAMATSURI is an anime I first became interested in due to an advertisement by Crunchyroll. There were two girls with psychic powers playing the game “Look that way!”, and it resulted in a girl with blue hair being the next one up for her turn. She immediately turned her finger to the side, calmly said “look the other way”, snapped the girls neck and caused a massive explosion to the side of the hill from her psychic ability being so powerful. Myself and my friend, RaS, being bored, decided we would watch some anime together. After showing him th the clip of the “look that way” game between the two girls, we decided that HINAMATSURI was definitely going to be what we watched. From the very beginning of Episode 1 — Arrival of the Psychokinetic Girl!, we can tell that Nitta is a gangster and has a taste for expensive art. Things within his life seem as if they were going splendidly until something falls from nowhere and clashes with his head and immediately he tries to ignore it. This anime from the beginning has many moments that makes you go “WTF! !”, and while I knew it was supposed to be a slice-of-life comedy with supernatural elements mixed into it, I had no idea just how outrageous it was going to be from the very start. Throughout the first episode they had many zany moments, many times were you were laughing at the reactions of the characters or the actions they were taking. The opening scene of the anime shows that it must be someone looking for our little psychic girl, Hina. Also, it shows me that Hina must be from another dimension where powers are more commonplace and adults use children as something you would find in Pokemon; i.e., they give the orders and the kids follow them without any will of their own (or maybe these psychic girls were created for that purpose?). Regardless of the reason Hina was sent, it is obvious that what was going on in her own world is nothing like how things are run within ours. The dynamic of Nitta and Hina shows that a naive looking girl can be cruel to get her way, while someone who is supposedly apart of the menacing Yakuza clan can be gentle of heart and understanding. I like the affections they show towards each other and I like how Hina is willing to go out of her way specifically because she cares about her new “caregiver” so much. 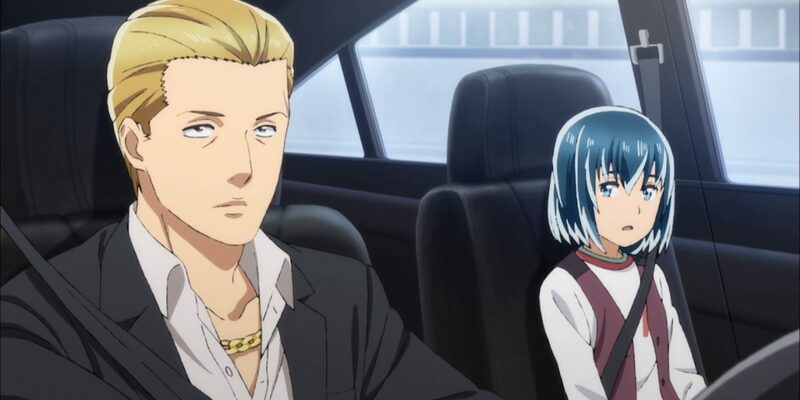 This first episode was absolutely amazing for HINAMATSURI; it gave you enough comedy, feels, and established a good connection between both protagonists without it seeming forced. This is definitely a show that I believe is going to be worthwhile in the end, though I will have to see by the time I finish it if it will hold up to its opening act.